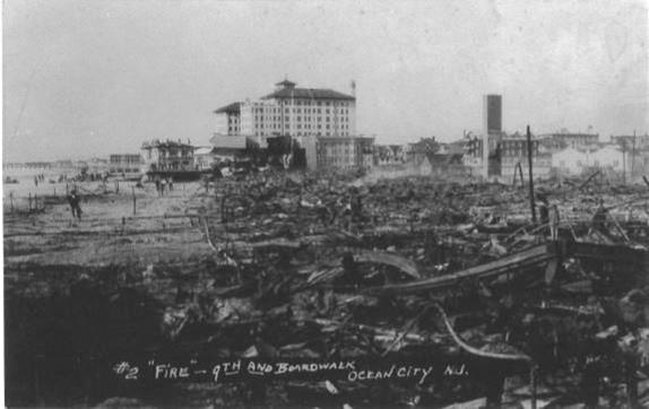 After World War I, Ocean City officials actively promoted the idea that a subsidized hotel would significantly develop the city’s potential. 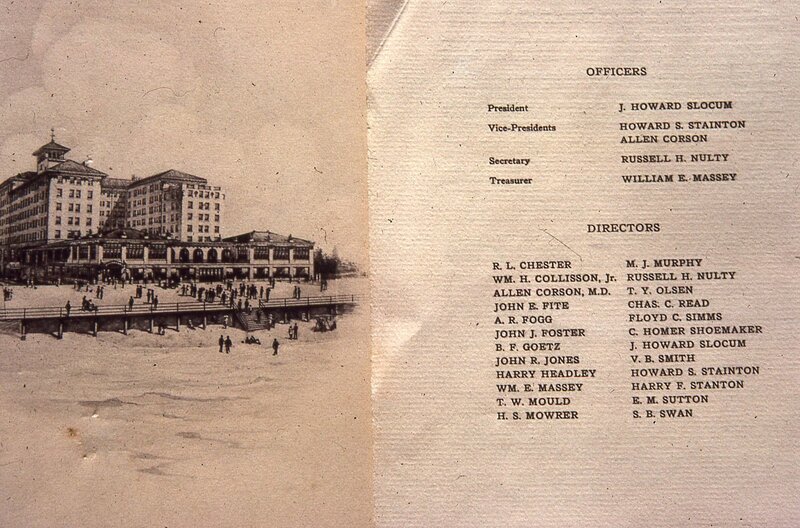 In the winter months of 1922, the Chamber of Commerce lobbied the Ocean City government and other groups for support. They explained how the completion of the Delaware River Bridge in Philadelphia would bring many more visitors to the Jersey Shore. 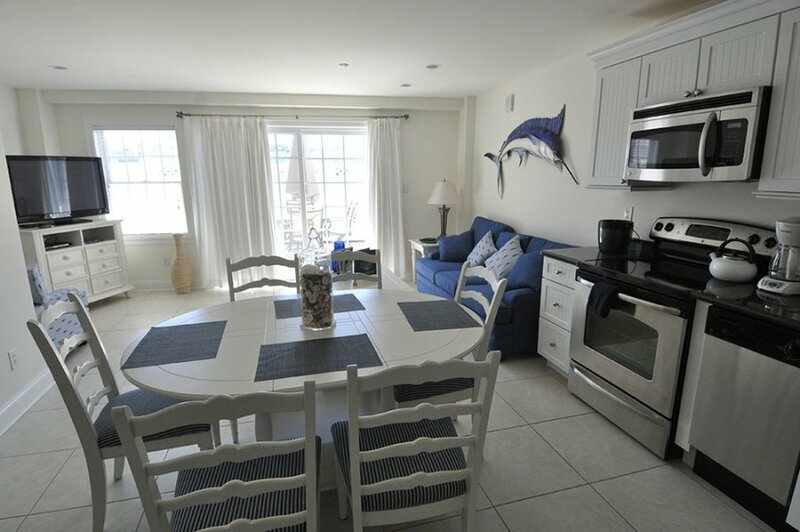 Being that Ocean City’s need for newer accommodations was well known, it was an absolute necessity to build a Grand Ocean Front Hotel to realize financial gains from this valuable beachfront property. As a result, the Ocean City Chamber of Commerce appointed a committee to thoroughly investigate the feasibility and demand for such a project. 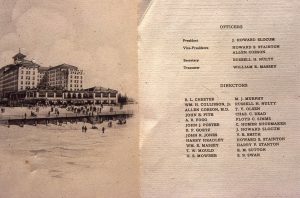 This committee became the Ocean Front Hotel Corporation (OFHC), a group of twenty-four local businessmen and prominent citizens. With this vision in mind, this group concluded that Ocean City could not hold her own against the competition of her resort rivals without this hotel. 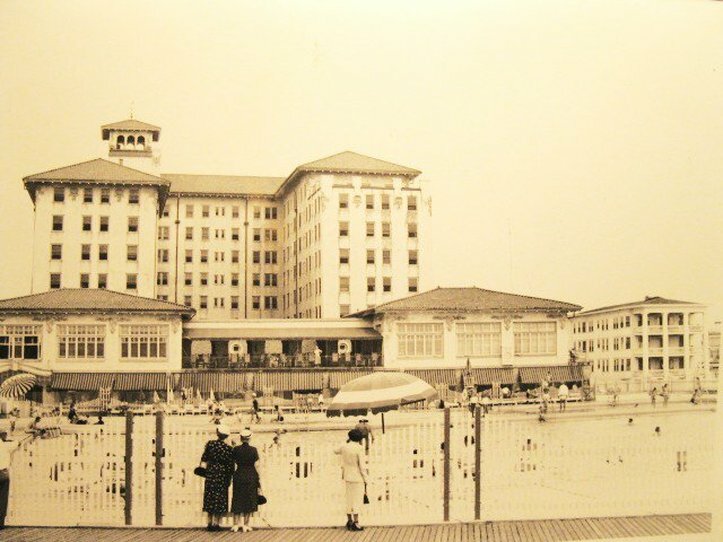 As a whole, the broader community hoped that a new hotel could revive the resort just as the Blenheim Hotel pointed Atlantic City in a positive new direction. For that reason, Ocean City residents assumed a large part of the financial responsibility, purchasing stock from the Ocean Front Hotel Corporation. Upon the suggestion of the OFHC, the organization chose to name the hotel “THE FLANDERS” in memory of the fallen Allied troops of World War I’s dreadful “Battle of Flanders”, fought in Belgium in 1914. To design this $1.5 million monument, the largest construction project in Ocean City to that point, the Corporation hired local architect Vivian B. Smith. Born in Ocean City in 1886, Smith left for an apprenticeship in Philadelphia after graduation from Ocean City High School, and returned in 1904 and began working for an Atlantic City architect. 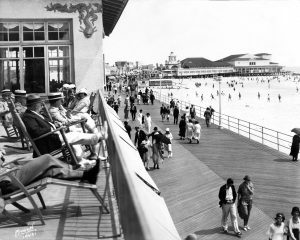 Smith’s professional contributions to Ocean City include the designs of City Hall in 1915, a new High School in 1924, and the Music Pier in 1929. The Flanders Hotel, constructed of tile roofing, steel girders and concrete, was billed as “fireproof”, a major consideration of that time in history. The use of these materials made the Flanders a uniquely sturdy structure and is largely responsible for its survival from the great fire of 1927 and other natural disasters that ravaged the shoreline for years to come. 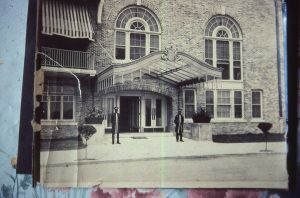 The gentleman overseeing the hotel’s construction was J. Howard Slocum who also oversaw the operation of the Greenbrier Resort in West Virginia. He added professional credibility to the project as a renowned hotelman, who also assumed management of the hotel once completed. 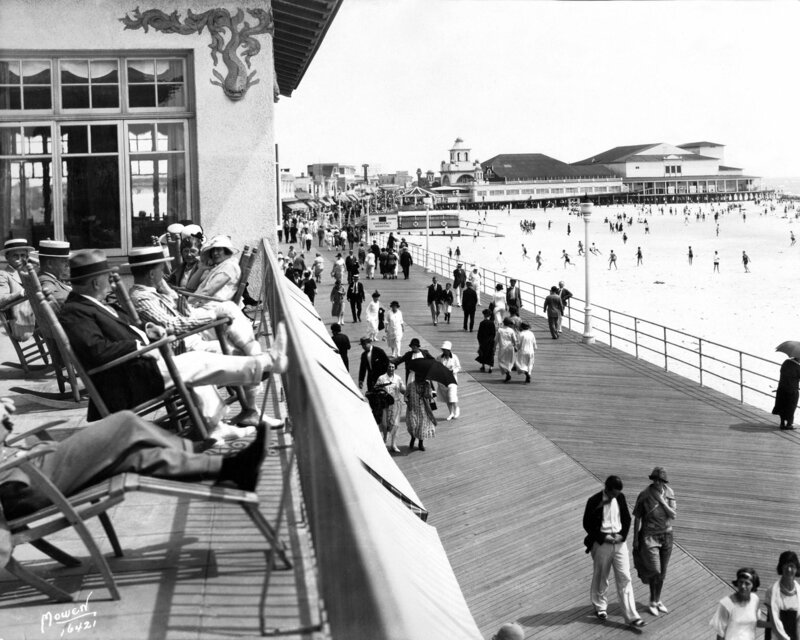 The hotel was built to transform Ocean City into a world-class venue. Whether it succeeded to reach that goal or not, it did make Ocean City a serious South Jersey destination. 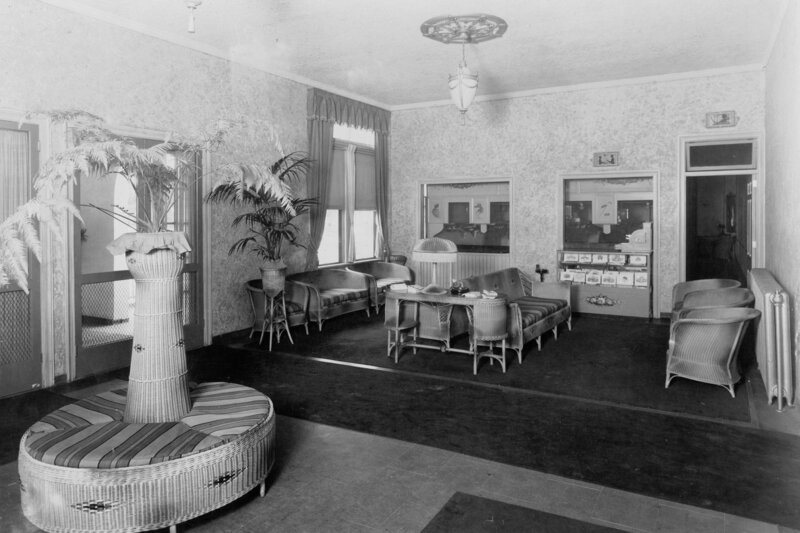 The 232 room hotel, with many sun decks, a swimming pool, and bath in each room, was constructed to compete with tried and true hotels along the coast. The Flanders was not complete on its opening day in 1923, but the ceremonies continued nonetheless. The rainy-day festivities on July 23rd ushered in a bright new era in the resort’s history. The event was held in the Flanders’ elegant ballrooms, which were adorned with images of poppies to symbolize the Battle Fields of Flanders. Guests enjoyed an evening full of speeches, fine dining and dancing. The “JEWEL of THE SOUTHERN JERSEY SHORE” was born. The Flanders became the new face of Ocean City. Approaching the island, the Flanders white washed structure towered above the landscape. Most of the buildings at that time were approximately four stories tall and overwhelmingly Victorian in nature. 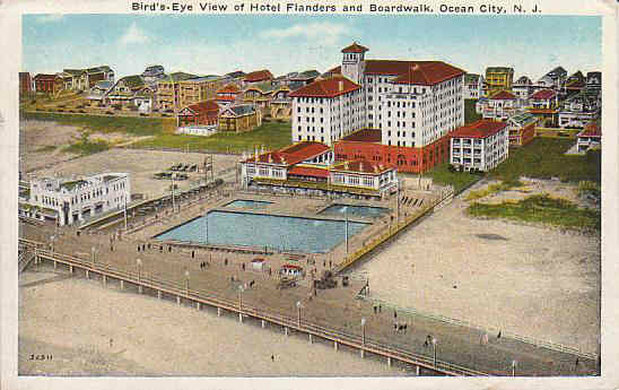 The Flanders was so prominent that it became a visual landmark, evidenced by the fact that almost any postcard or official photograph of Ocean City prominently featured the hotel. 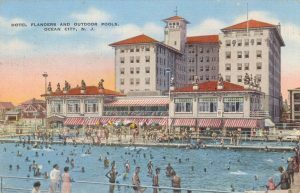 In order to compete with traditional hotels and truly become a renowned resort, Slocum introduced higher standards of service to Ocean City. The Flanders attempted to become a “palace-like emporium” by hiring bellhops, doormen and front desk clerks to service each and every guest. 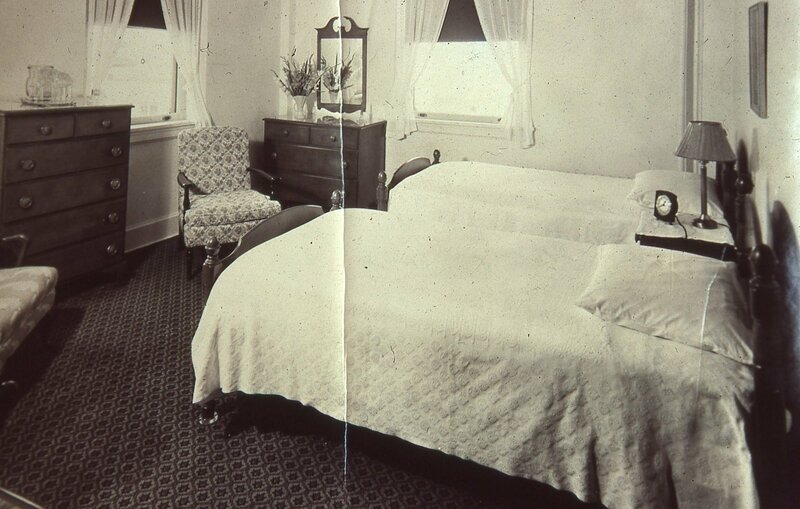 This “Flanders model” proved so successful that entrepreneurs planned and constructed other hotels to meet the demand. 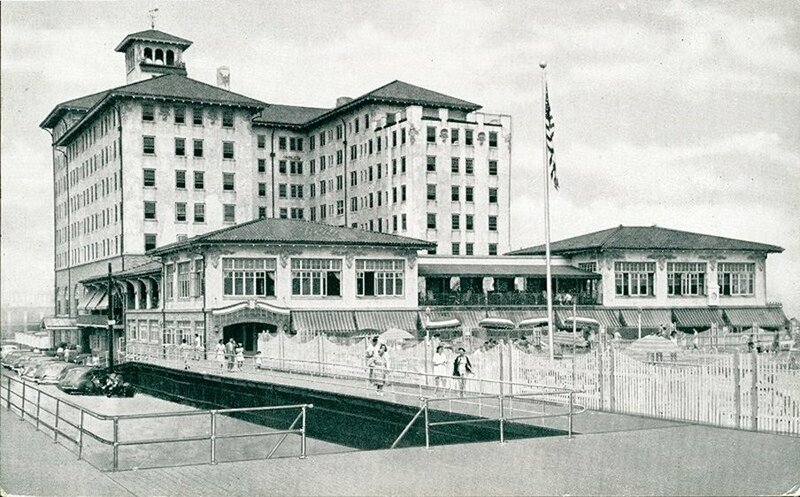 Two other high rise hotels were constructed along the boardwalk between 1923 and 1930; the Delaware Hotel in 1925 and the Hotel Hanscom in 1929. Neither of these hotels proved to become a serious threat to the Flanders business. The Flanders billing as “fireproof” became overwhelmingly evident after the devastating fire of 1927. The blaze leveled every structure along the boardwalk except the hotel. 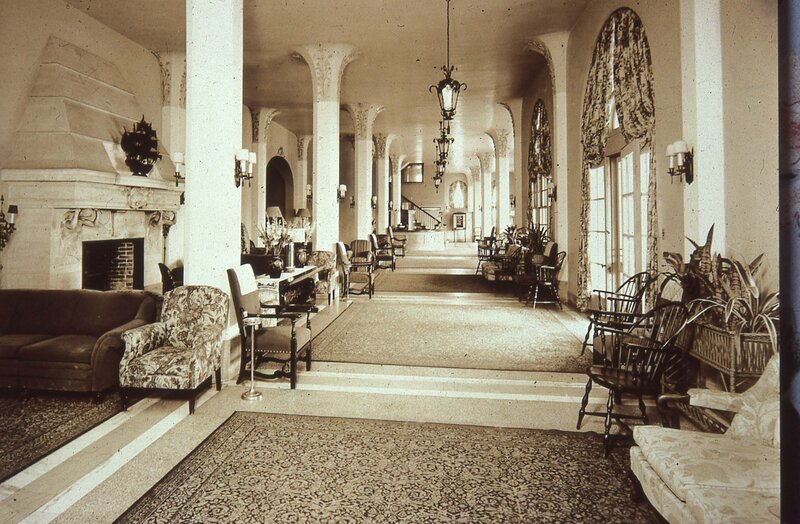 Officials estimated that nearly 500 guest rooms were destroyed by the fire. The city officials felt that they needed to have a modern hotel built to accommodate the summer crowds. The result was a proposal for a fourteen story, 300-room structure to be named the Mayflower Hotel. This hotel would have relegated the Flanders to become the resort’s white elephant. Of course when the Flanders was built its intent was to be a catalyst for bigger, better, and different types of structures. In the end, the great depression was the catalyst that caused the proposal for the Mayflower to be abandoned. 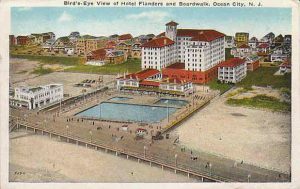 Had the timing been different, Ocean City would have grown into a drastically different place, and like various hotels in Atlantic City, the Flanders would have likely been demolished as a victim of its own success. To ensure its success and continue to move the Flanders forward, Slocum took advantage of new opportunities to upgrade existing amenities and cement itself as the “QUEEN of OCEAN CITY’S HOTELS”. The most notable addition occurred after 1927. The city quickly recovered from the fire and rebuilt the boardwalk, a half a block closer to the ocean. As the only remaining structure, this decision now effectively moved the hotel away from the beach. 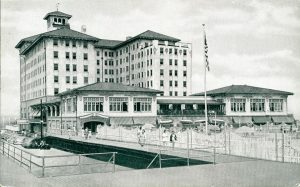 To keep from losing its beachfront status, Slocum and OFHC decided to build an extension of the main boardwalk that would connect with the hotel. By 1928, the Flanders enjoyed local stardom, but Slocum still sought national attention as a valuable tool to put itself above the competition. 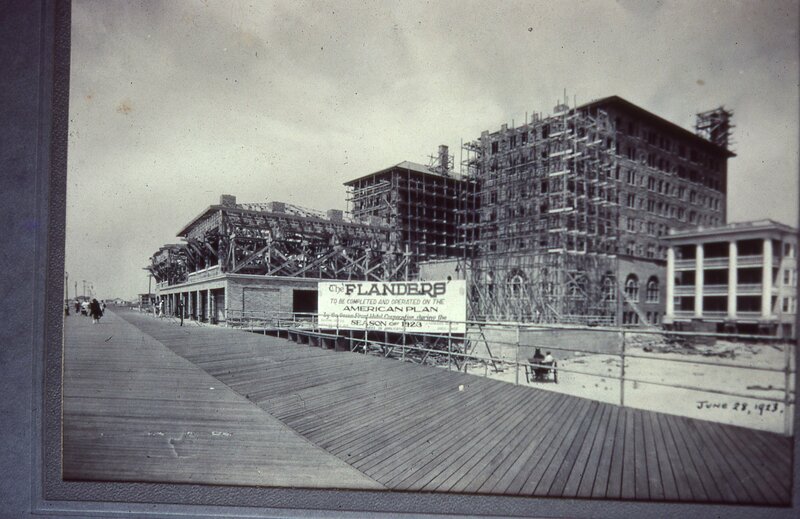 With the opportunities offered by the 1927 fire, Slocum utilized the one acre boardwalk extension to transform the Flanders into a more dominant recreation attraction. 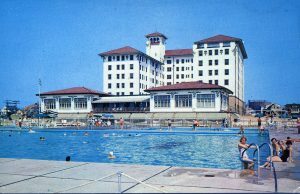 In July of 1929, Slocum opened three new salt water pools in this space; Olympic-sized main pool, children’s pool, and diving pool. 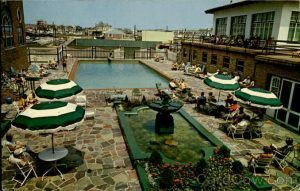 The Flanders kept its original pool, a 20’ by 55’ outdoor pool in its courtyard, to be used exclusively by their guests. 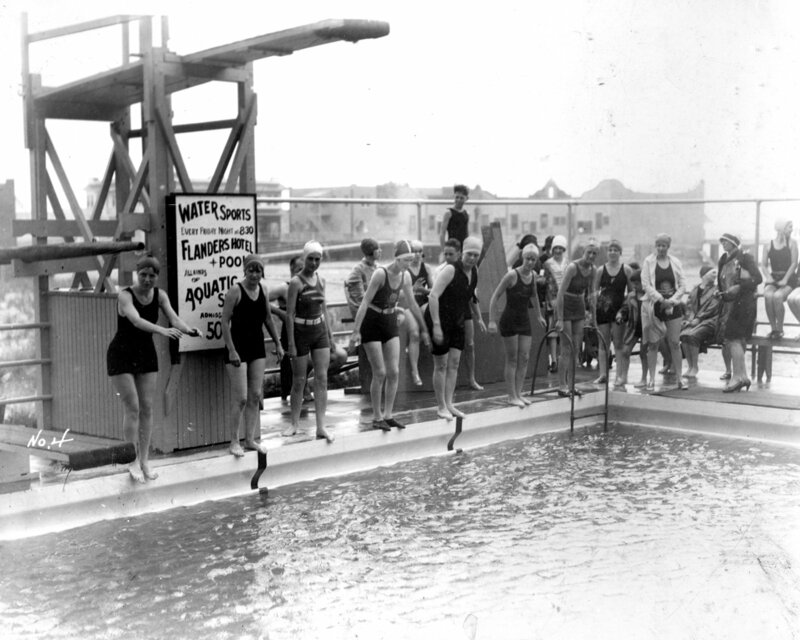 The salt water pools were open to the public and soon became the most popular attraction in Ocean City. 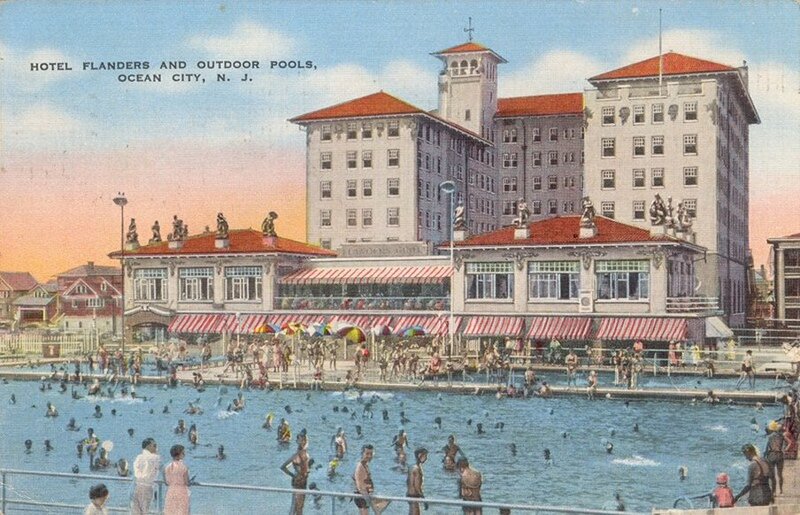 During summer days these pools would be filled with swimmers while boardwalk strollers would stop to watch the fun. At night, the Flanders maintained its tradition of holding local and regional swim meets which were previously held in the courtyard pool. Slocum then added spectacular water shows featuring Olympic athletes like Johnny Weismuller and the renowned Ocean City Beach Patrol. 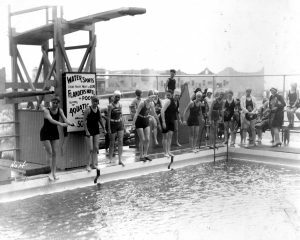 The events at this pool complex became so popular that the Flanders’ management lined the main pool with bleachers to accommodate the thousands of spectators. 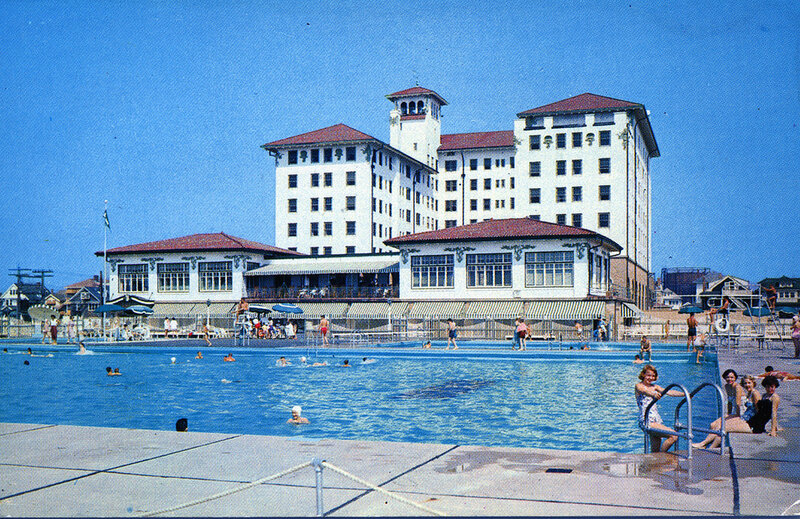 The Flanders’ three front pools were instrumental in showcasing the hotel as a major attraction. But its reputation for service and style, which was truly based on its elegance and sophistication, continued to entice families to vacation at the hotel. Its high-styled rooms, architectural detailing, dining facilities, and shops made it the hotel of choice for those looking to experience the best of the Jersey Shore. This reputation for style aided Slocum’s drive to reach a more national audience. In 1929, the Flanders’ hosted the National Marbles Tournament, a local and state event sponsored by community newspapers. 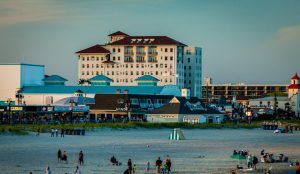 The media sparked tremendous interest in the hotel by advertising the grand prize as a trip to Ocean City and a stay at the immaculate Flanders Hotel. The stock market crash in October of 1929 and the depression era that followed, were devastating to the Flanders. The population in Ocean City declined and demand for premier accommodations decreased dramatically. 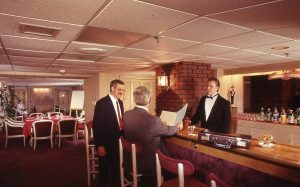 After a few years of financial struggles, the Ocean Front Hotel Corporation was forced to sell the Flanders to Elwood Kirkman, a multimillionaire banker and prominent lawyer from Atlantic City. Most of the original investors were paid dimes to the dollar. 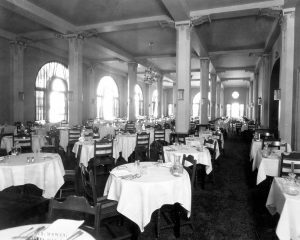 The 1930’s were difficult times for the hotel and the city. Under Kirkman’s management, even in these hard times, the Flanders maintained a large staff. Kirkman maintained the hotel with an atmosphere of hospitality and solidified The Flanders as Ocean City’s focal point. Over the years guests included such luminaries as Vice-President Charles Curtis, the three Lit Brothers of Department Store fame, cartoonist Al Capp, actor Jimmy Stewart, and of course, Grace Kelly. After the Depression, Ocean City’s development remained relatively stagnant and its hope of being a national resort like Atlantic City faded quickly and the city grew content being a regional destination. Recovery really didn’t begin until a few years after World War II. The city began moving in this direction, with the Fountview motel opening in 1955 which was followed by no fewer than eight other motels. From this time through the 1950’s, amidst this new wave of motels, the Flanders’s existed as the resort’s prominent hotel. For an average of $17, guests could enjoy what was still promised to be Ocean City’s largest and most complete resort. In the 1950’s Mr. Kirkman continued to keep the face of the Flanders in front of the public eye. 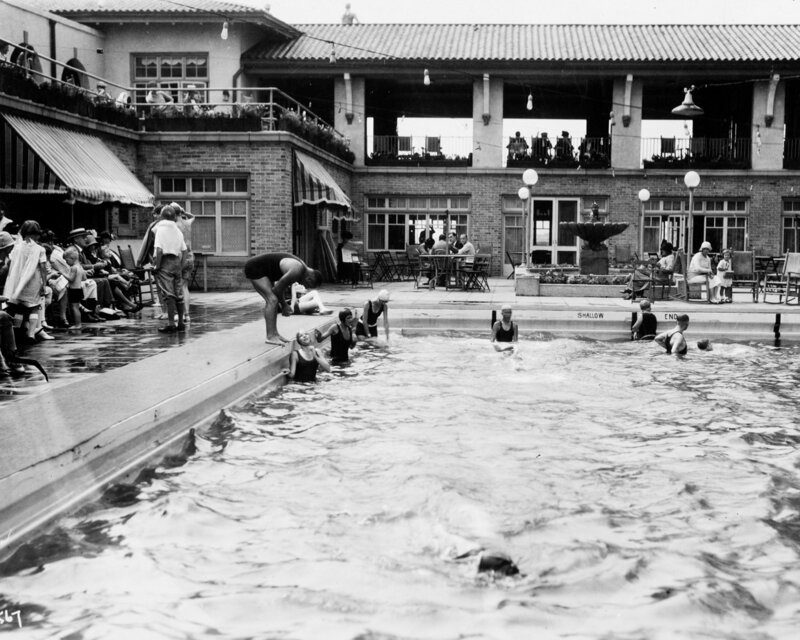 The three public pools were staffed by more than 30 trained instructors and life guards daily. More than 1,500 children and adults would learn to swim each and every summer. In 1950 the Miss New Jersey Pageant was held poolside. In 1954 the Flanders Hotel was home to the Diamond Jubilee Water Show. 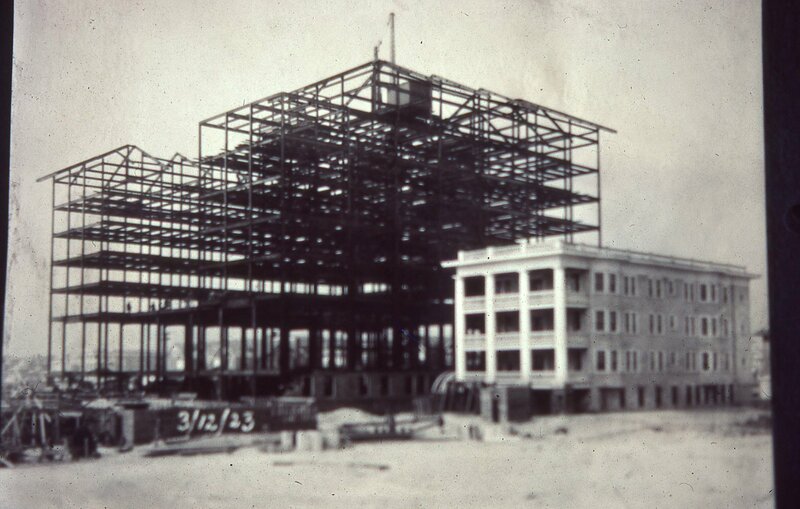 And in 1960 Mr. Kirkman built a two story Penthouse for his family on the North Tower of the hotel. These were elegant and spacious accommodations, spread over two floors, that consisted of five bedrooms and 5 baths. The Flanders’ most direct competition opened on May 22, 1966. 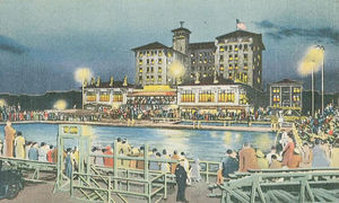 The Port-O-Call Hotel and Motor Inn opened on the boardwalk at 15th Street. It sparked excitement for the city just like the Flanders did in 1923. It was not the Port-O-Call’s size but style that proved to be the factor in demoting the Flanders to second position. Like its predecessor, the Port-O-Call ushered in a new wave of modern design and became the new model to compete with rising resorts like Wildwood. In a very short period of time the Port-O-Call replaced the Flanders as the face of Ocean City. A period of “bigger is better” descended upon the resort and from 1970 – 1978, most of the resort’s iconic hotels, the Delaware, Breakers, Lincoln, Illinois, Strand, and the Colonial came crashing or burning down; often replaced by newer or larger motels and condominiums. These developments left the Flanders as the oldest remaining hotel of Ocean City. The Flanders struggled during and after this new wave period. Due to increasing maintenance costs, the Flanders’ large pools closed for good on Labor Day 1978. The hotel struggled under its current setup and never recovered. The one acre pool lot sat vacant, basically a empty sand pit into the 1990’s. In the early 1990’s a developer installed a small amusement park in that space. In 1995 the Simpson Family bought parts of the Flanders property and expanded Playland from a one to three acre facility. The year 1991 proved to be the Flanders’ worst financial year in its history. In February of 1993 a sheriff sale was held to raise funds to pay some of the bills that were out of control. In October of that year Elwood Kirkman passed away at the age of 89. Kirkman’s daughter, Carol K. Parks took over ownership of the Flanders. Ms. 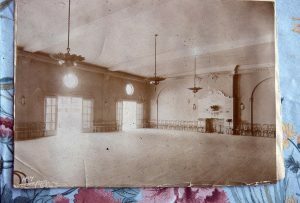 Parks took over a hotel that was drowning financially. In July of 1994, with no solution in site, she put the Flanders and 5 other properties up for sale for 13 million dollars. With no immediate buyer and no funds to operate, the hotel was forced to close its doors for good on May 8th, 1995. Later in 1995 The Franklin Building Corporation (FBC) started discussions with the City to turn the Flanders into a year-round retirement complex. The Mayor, Mr. Henry Knight, and officials were not in favor of this plan and fought to make sure this would not be the fate of the Flanders. Mayor Knight and Ocean City Officials were eventually sued by FBC, stating that their actions violated the “Fair Housing Amendment Act of 1988”. In January 31st, 1996 Mr. James Dwyer purchased the Flanders Hotel. 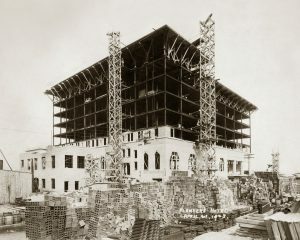 Understanding the history of the renowned hotel, Mr. Dwyer spent a couple of years and more than 12 million dollars renovating the building’s 232 rooms into ninety-five condominium. On Labor Day weekend in 1997 the Flanders re-opened with the Drifters and Coasters as the entertainment acts. In 2000 construction was started on the five new penthouses to be built on the top of the South Tower of the building. The early 2000’s were very difficult times for the Flanders. Starting in 2001, the 20,000 square foot banquet center, the partially built penthouses and the large parking lot across the street all went into foreclosure. The Dwyer Organization was removed from the management of the hotel. Dwyer’s legal problems began to surface and various banks took control of numerous assets of the hotel: the front desk, management offices, boilers/ mechanical rooms, pool access, freight elevator, telephone room, etc. The elegant banquet facilities officially closed in September of 2002. All furnishings and equipment were sold at Auction (tables, chairs, decorations, Persian rugs, oriental rugs, carved wood thrones, grand piano, and other expensive items). 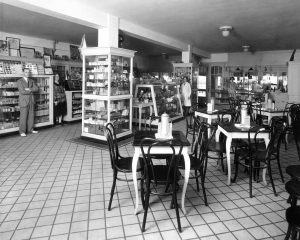 A group of owners called “The Friends of the Flanders” and local residents came together and tried to buy some of the furnishings back. In 2003 the adjacent small parking lot went into foreclosure and the larger parking lot across the street was sold for 6.2 million dollars. There were also three suspicious fires at the hotel with the last two ruled intentional. As a result of all these occurrences, the Flanders was engulfed in numerous law suits and legal battles. Beginning in 2003, the individual owners of the Flanders began to start the process of survival of the Flanders both financially and as a vacation destination. 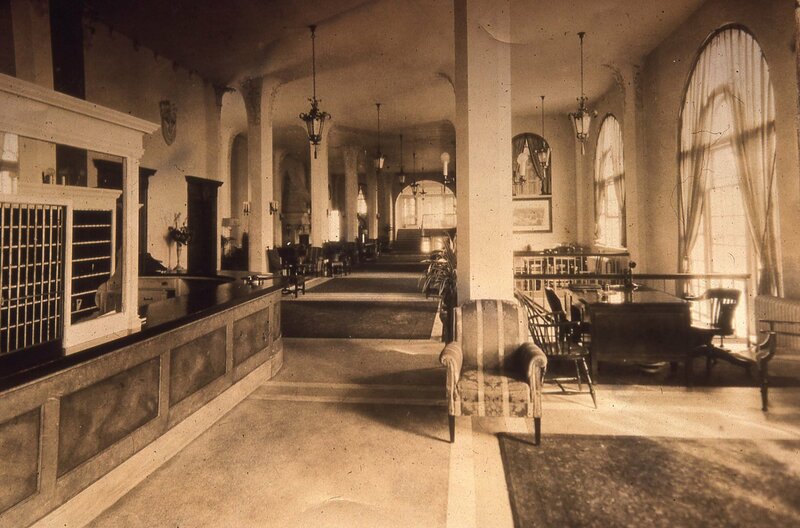 At this time the Flanders was not permitted to operate the hotel from the front desk. The owners set up a card table and chairs in the lobby to handle all the reservations. The owners were assessed heavily to keep the hotel a float. Two board members, Phil Schwehm and David Kleeman, were instrumental in brokering a deal with Republic First Bank, to purchase the front desk for $750,000. In 2003, Ocean City Partners (OCP), a group of local businessman, became an important part of the re-emergence of the Flanders Hotel. OCP became a partner of the Condominium Association by purchasing the 2nd floor banquet center and the adjacent parking lot. 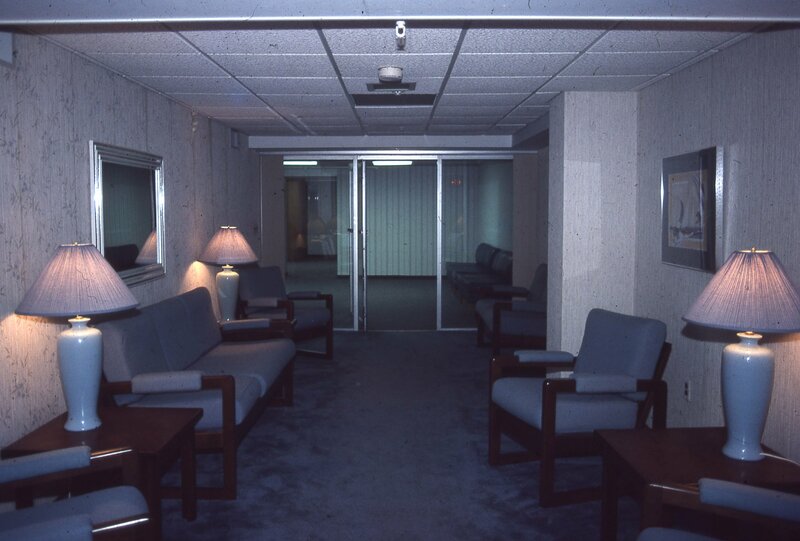 The 2nd floor facility, that was dark since 2001, was once again an important part of the Flanders. 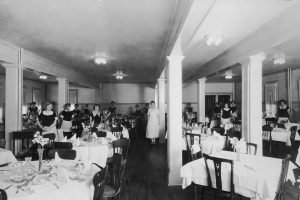 By investing money and running the banquet facility in a professional and organized manner; brides, organizations and groups began to come back to this historic hotel. From 2003 through 2005 the Flanders continued to struggle but the owners and various board members did all that was possible to keep the Flanders Hotel operational. On February 24th, 2005 an Amended and Restated Master Deed was completed. The hotel would now operate as “The Flanders Condominium Association”. Even under these new guidelines The Flanders continued to struggle mightily both financially and operationally. At the end of 2005 the association found itself in the following condition: financially strapped after showing a loss of approximately 500,000 dollars, buried in legal expenses of over 300,000 dollars, hundreds of fire code violations, a collapsing pool deck, (braced up with hundreds of support jacks), and the hotel was under pressure from The Department of Affairs to close the hotel as the exterior of the hotel was deteriorating rapidly. At this time financing was crucial to the survival of the Flanders. Newly elected President of the Board, Peter Voudouris, who was elected to the board in a special court ordered election, started the search for financing. After meeting with the executives and board members of Sun National Bank for many months, Mr. Voudouris was able to secure a 2 million dollar construction loan. Once obtained, the renovations to the exterior of the building and pool deck began. In the period of 2005 through 2007 additional first class accommodations were added to the Flanders. Ocean City Partners converted a section of the banquet facility, known as the Atlantic Rooms, into seven spacious and upscale condominiums. The five elegant Penthouses located on the top floors of the building were finally completed. These developments brought luxurious two and three bedroom accommodations to the Flanders. In 2008 the Board of Trustees hired Public Historian, Alex Bethke, to start the process in order for the Flanders to become listed as historically registered. After almost two years in the making, at a presentation in Trenton, NJ on November 20th, 2009, the Flanders by a unanimous vote was placed on the National Register of Historic Places. 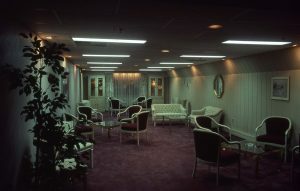 Later that year, the interior stores on the second level of the lobby and the barber shop by the parking lot entrance, which were dark for many years, were purchased by Peter & Arlene Voudouris. The shops are now filled with clothing, gifts and antiques. The barber shop is now home to “Coffee Express”. The boardwalk stores which were non-operational, an eye sore for many years were purchased by the Walter Development Group. After trying unsuccessful to operate a commercial food concession facility, they received approval from the city to change the zoning to residential. In 2010, 9 one, two, and three bedroom condominiums known as the Lanai Suites were built and became part of the Flanders Condominium Association. In January of 2010, after approximately a year of negotiations, the owners of the Flanders Condominium Association purchased the Banquet Center Facilities, the adjacent parking lot, and all the holdings of Ocean City Partners (OCP) for 3.1 million dollars. This feat was accomplished by some creative financing. Mr. Voudouris was able to secure a second loan from Sun National Bank and a short term loan from OCP, with the balance paid by the individual owners of The Flanders by way of a one-time assessment. Presently the Flanders is a thriving destination for guests all year round. The accommodations range from Luxury Suites to Spectacular Penthouses. The Flanders is the only full service hotel in Ocean City that includes: elegant ballrooms & meeting rooms, full service restaurant, Shoppes at the Flanders, Coffee Shop, Salon & Spa, Fitness Center, Business Center and heated outdoor pool. The Flanders has withstood much adversity and hardship through the years. 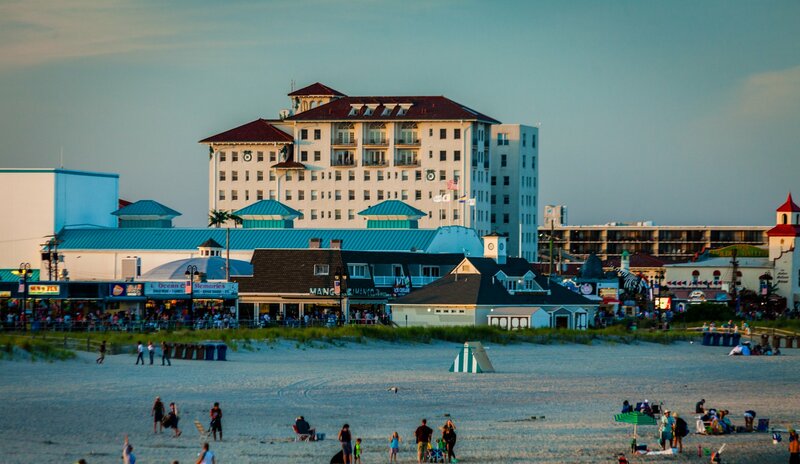 Nonetheless, it has remained Ocean City’s premier accommodation, a landmark known throughout the region, state, and even the nation for 90 years. Throughout it’s history many have worked to retain the Flanders’ grand style when other hotels were falling by the wayside. The community is fortunate that this architectural marvel has survived as one of Ocean City’s historical treasures. 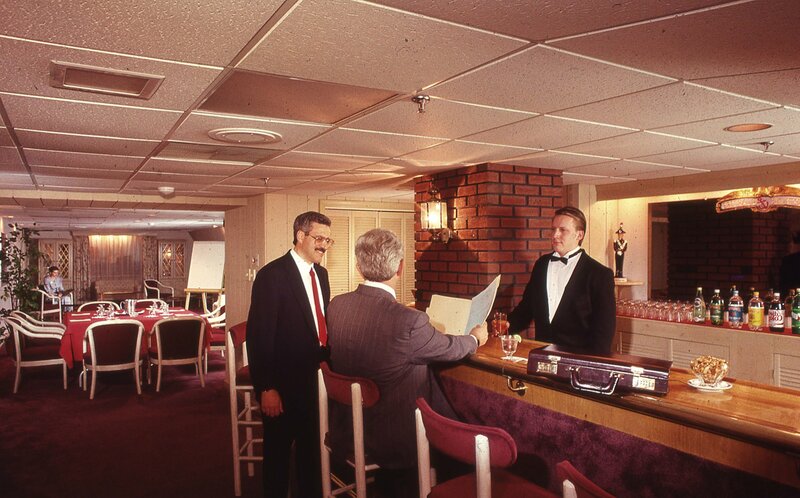 As an important part of Ocean City’s past, the reassurance of the Flanders Hotel is just as important to the future of Ocean City, known throughout as America’s #1 Family Resort. During the planning phase in the construction of the Flanders in 1923, it was decided to install a full basement below sea level grade that became known as the “Catacombs of the Flanders”. 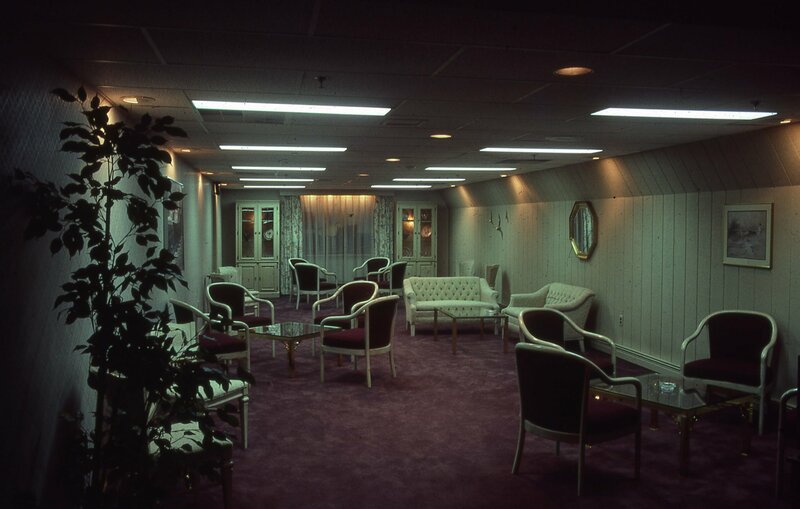 This basement area contains a maze of seven or eight expansive rooms. In order for this area to be functional there had to be a way of keeping water from entering this area. The builder, D.A. McClelland Co. of Philadelphia, installed a multi-pumping station system throughout the Catacombs. This system has gone through numerous upgrades and is still in existence after 90 years. In the 1920’s and 30’ organized crime was a major force influencing business operations throughout the country and the east coast was no exception. Ocean City, being one of the few thriving areas in South Jersey during this time, was an ideal neutral location for occasional meetings by organized crime bosses from New York, Pennsylvania and Atlantic City. And of course the perfect place to hold these meetings was in the private catacombs of the Flanders. The 18th Amendment which was passed in 1919; barring the sale, manufacturing and transportation of alcohol, ended up becoming a major financial gain for organized crime families. One of the developments that occurred from this legislation was the opening of speakeasies, which were illegal bars and salons that opened up all over the country. The Flanders was no exception with speakeasies set up in the catacombs. In 1929 the opening of the salt water pools turned the catacombs into an instrumental area of the hotel. 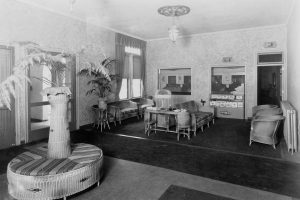 In the 1920’s and 30’s guests were expected to be well dressed and were not allowed to enter the lobbies in bathing suites. Guests would enter the catacombs through a back stairwell and would either climb the steps to enter the salt water pools or go through the tunnel that went under the boardwalk, in order to go to the beach. The bathers and beach goers would come back to the hotel, enter the catacombs, and use the changing rooms and showers at their leisure. During the middle of the century the catacombs were equipped with two prominent bar areas, and rooms set up for card playing and other recreational activities. These areas were specifically labeled as the Island, Captain’s and Inlet Rooms. Private parties were held serving food and liquor in these rooms on many occasions. In the late 70’s through 1995 the catacombs were used exclusively by the maintenance department. 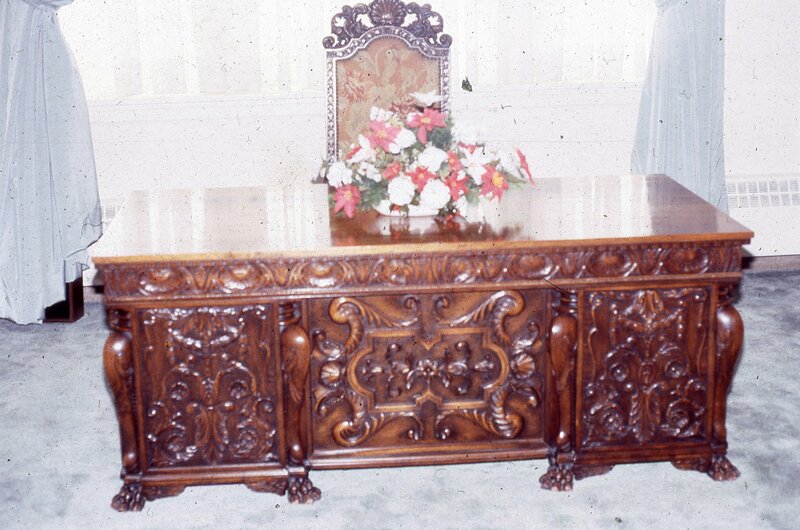 There were offices, machine and wood shops, all set up to support the operation of the hotel. Through the years major storms have caused extensive damage and flooding to the catacombs. The storm of 1962 flooded the catacombs with water heights reaching 52”. The storm of 1984 was a little kinder with water levels only reaching 39”. But Storm Sandy was the most devastating with water heights in the catacombs reaching 55.5 inches. These water levels are marked and labeled on one of the columns in the back section of the catacombs. Today the catacombs are used only for storage. Possibly someday they can be restored where guests will be able to tour this basement area and relive the history of the “Flanders Catacombs”.